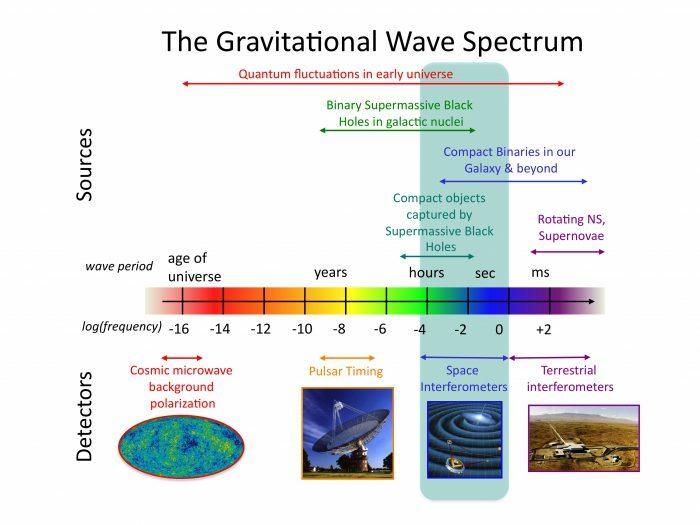 This ‘new window’ means: If we can ‘see’ gravitational waves, an entirely new spectrum of observation opens up, reaching much further than the electromagnetic spectrum we’re used to in astronomy (that includes visible light, infrared, radio and X-ray astronomy, among others). 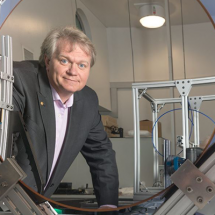 In the future, a more advanced gravitational wave astronomy could strive to “cover the whole universe, farther than electromagnetic waves could ever take us and open the more than 99 percent of the universe that are dark to direct observation,” as Karsten Danzmann, Director of the Albert Einstein Institute in Hannover explains when asked about the LIGO findings. And ‘covering the whole universe’ entails covering most of its history, because events billions of lightyears away are not only far away in terms of space, but they’re by definition also in the distant past. These elusive but important waves are an integral part of Einstein’s general theory of relativity from 1915, stating that neither time nor space are absolute but can be both stretched and squeezed by the gravitational force of large masses. In a nutshell: You can build a very solid bridge with Newtonian mechanics, but no satellite. For a geostationary satellite, you need to take into account that time runs slower at high velocities, according to Einstein, but time also runs faster further away from a large source of gravity (in this example: the Earth; and the latter effect outweighs the former). The mathematical model of spacetimes combines space and time as a continuum – that’s where the name ‘ripples in spacetime’ comes from. 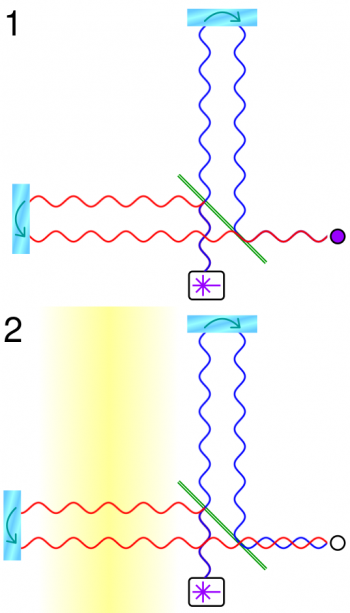 Simplified LIGP principle: Figure 1: A beamsplitter (green line) splits coherent light (from the white box) into two beams which reflect off the mirrors (cyan oblongs); only one outgoing and reflected beam in each arm is shown, and separated for clarity. The reflected beams recombine and an interference pattern is detected (purple circle). Einstein predicted that violent cosmic events emit gravitational waves but until last February, most researchers didn’t know whether they would ever be detected directly, or if maybe the theory needed an overhaul. Different events emit waves at different wavelengths (see graph below) and with varying amplitudes. Current instruments are only able to ‘hear’ the ‘loudest’ sources, due to instrument sensitivity. Interestingly the LIGO observation of 2015 happened within days after Advanced LIGO went operational with a notably increased sensitivity. Danzmann’s institute in Hannover, that has its own interferometer, played a major role in upgrading LIGO as part of the LIGO Collaboration. Apparently nobody expected “that the first signal was a black hole–black hole merger, since the detection rates were so uncertain, and the physics was not sufficiently understood,” says Michael Kramer, director of the Max Planck Institute for Radio Astronomy in Bonn. If you wonder, what does radio astronomy have to do with this, here’s the explanation: the two LIGO interferometers each operate with two 4 km laser beams in a vacuum system. The slightest variation of beam length can be detected with interferences (see graph on the right). 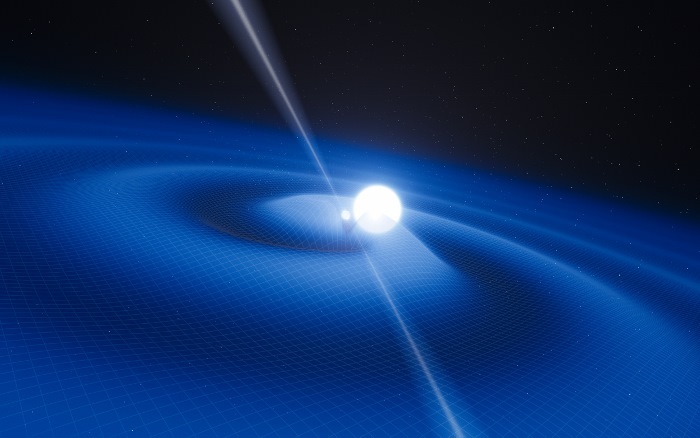 But pulsars, rotating neutron stars that emit electromagnetic radiation that can be ‘heard’ as radio signals, can be regarded as gigantic ‘laser beams’ in space, helping the search for gravitational waves. The advantage is clear: these beams are already there, and they can be several lightyears long. 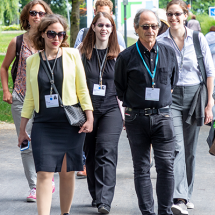 Prof. Kramer’s institute is not far from the Effelsberg radio telescope with its 100 meter dish. Effelsberg is part of the European Pulsar Timing Array EPTA that in turn belongs to the International Pulsar Timing Array IPTA, along with two other consortia. The researchers hope that a collaboration between large radio telescopes will hurry up the detection of the next gravitational waves: “With the current telescopes, we constantly add new pulsars to the experiment, which increases the sensitivity of the experiment further. I expect that we’ll detect a signal in a few years,” Kramer explains. At the latest, “new telescopes like MeerKAT and eventually SKA will certainly lead to a detection.” Both telescopes are still under construction, MeerKAT is located in South Africa, SKA is also being built there, as well as in Australia. I asked Prof. Danzmann about the next possible detection as well, because the new field of gravitational wave astronomy requires many detections in order to either learn something new about ‘invisible’ objects – or to detect previously unheard-of objects. He answered: “Currently only ground based laser interferometers are operating, so it is clear that is where the next signals are going to be. All ground-based detectors are operating as a network, that is they form one big Earth-bound detector and are operated jointly. The next observing run will start in September (…), and the two LIGOs should be on the air with even higher sensitivities.” Danzmann is referring to space interferometers: the European LISA Pathfinder space mission, a test satellite for the later eLISA (Evolved Laser Interferometer Space Antenna), is currently operational – and its results from the first 90 days “exceed all expectations”. “With LISA, we’ve created the most quiet place known to mankind,” Danzman commented a new paper published on June 7, 2016 in the journal Physical Review Letters. LISA’s job is to test crucial technology for space interferometers, but it’s no detector. The future will tell which approach will present the second direct detection of gravitational waves: ground-based interferometers or pulsar timing arrays. But it’s not all about competition – every detection contributes to our knowledge about gravitational waves and the objects emitting them. According to the LIGO Caltech website, the following questions can now finally be tackled by astronomers: “How many neutron stars and black holes reside in a typical galaxy? 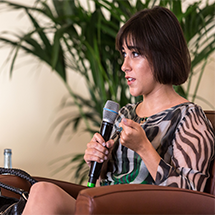 How do binary systems with these objects evolve, and how often do they coalesce?”, and many more. Already it looks like Einstein’s predictions for merging black holes could be verified by the GW150914 data. Another example: the LIGO Collaboration expects about forty detections per year just from merging neutron stars once LIGO reaches is highest sensitivity. Finally I asked Prof. Danzmann at which point researchers would start getting nervous if the next gravitational wave couldn’t be detected. He pointed out that another four months of LIGO data were currently being analyzed, “and nobody who knows the data is nervous!” So we might be in for a big surprise quite soon. 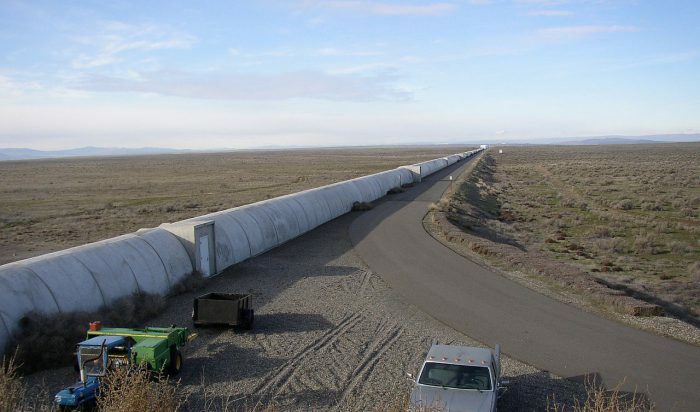 Added later: Just six days after this article was published, the LIGO Scientific Collaboration announced that it found the second gravitational wave observation in LIGO data from December 2015.